Remember those Science Fair projects you had to do in about 7th grade (and your kids still do)? You had to come up with a topic, supposedly do research, and finally, had your mom and dad help you out the night before it was due? Well, we sort of felt like we were doing one of those over the weekend... with the exception that we got to drink wine while conducting the experiment... not what you did in 7th grade! 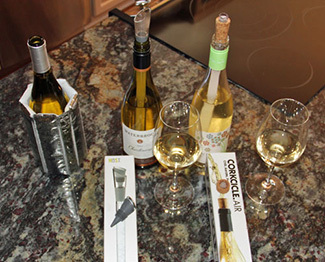 In 2010 we began carrying the "Corkcicle," a device designed to keep your white wine chilled. It sold for $22.95 and, at the time, I thought it might be one of the dumbest wine accessories I had ever seen. 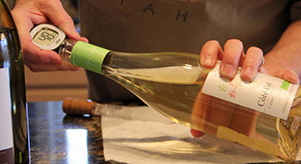 Shaped like an icicle, you froze it in your freezer, then poured a full glass from your pre-chilled bottle to make room, and inserted it to maintain the wine's chill. To me, the real problem was that every time you wanted to top off a glass, you needed to pull the icicle out of the bottle, drip all over the counter and then re-insert it into the bottle. Pull, drip, repeat... and, they sold like crazy that first Christmas... I could only assume that Oprah must have endorsed it, and she had! A few years ago they introduced an upgrade, the Corkcicle Air, that adds an aerating pourer to eliminate the drips and ups the price to $39.99. They also acquired a competitor, the Host Cooling Pour Spout, much cheaper at $19.95. Both do the same thing the original Corkcicle did, just without the drips. We typically serve most white wines well above refrigerator temperature (40° to 42°) at 48° to 50°, which really brings out the aromas and viscosity in most whites. The problem is that they do warm up pretty quickly, a problem we solve by using a cooling sleeve, like the one shown above on the left. You just can't leave it on very long because it's designed to chill a bottle and not maintain a steady temperature. Since both the inserts still seemed kind of pricey and a clumsy way to keep your wine cool, we decided to test them and see if they actually worked. So, armed with an instant-read thermometer and three bottles of wine, we decided to find out. We tested the wines at opening and then at 15 and 30 minute intervals. All three wines started at 44° to 45° degrees. We poured a short pour from two and inserted the chiller pourers into the bottles. We let the third bottle stand for 15 minutes and then put the chilling wrap on it to see what it did. After 15 minutes, the Corkcicle wine was at 47.3° and the Host was at 48°,very good drinking temperatures. The third bottle had warmed to 54° so we placed a cooling sleeve on it. After 30 minutes the Corkcicle wine had only risen to 48.8° and the Host to 50.2°. Damn, these things actually work. They had both maintained an almost perfect serving temperature for over 30 minutes and actually continued to do so for another 10 minutes! In the meantime, the sleeve had dropped the third bottle to 35.9° in fifteen minutes, not a good option. Bottom line, if you are picky about the serving temperature of your wine, these really are a great option.